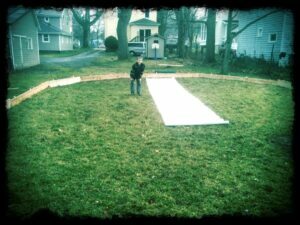 Our family’s adventure (over the first couple years) learning how to build a back yard ice rink—from experience! One thing is for sure: we’ve learned quite a bit of what not to do along the way! It all started with a slight modification of the original plans. 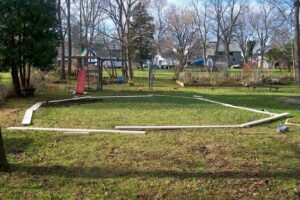 When we first thought we’d attempt to make an ice rink in our back yard, we thought we’d follow my brother-in-law’s simple rectangular model. 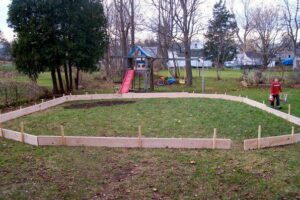 But then, being one to investigate online, I found a post with (very loose) instructions for setting up more of an oval rink, so pucks won’t get trapped as easily in the corners. It looked straightforward enough. All you do is add another board, cut in two, on the corners. Easy! We determined the amount of wood needed. Even divided it up in the 2 x 8, 2 x 10, and 2 x 12s, according to where they would be placed in relation to the grade of the land. (Which, is probably a tad too steep for an ice rink!) We had it all nicely planned out, and even laid out. See, not only did we not account for the different angles needed (two boards cut to make a “corner” of an oval are not cut at 45º angles… it’s true! They’re not!) we—or rather, I?—did not remember that the length of the boards was also an important factor! So that meant breaking out old algebraic formulas (and some very handy angle calculators on the internets…) to figure out that we needed cuts of 22.5º to but up against the long flat boards, and cuts of 11.25º in the middle of the two cut boards. Nice! The fun part there was trying to set the saw to an angle of 11.25º! Once we had cut all the boards, we had to fit them all together. Sadly, we did not measure the length of the angled boards very meticulously. What we did was just push the boards out as far as the angled boards “forced” us to go. (This will come into play just a bit later in the story. Stay tuned.) Once we had made our oval based upon that, we discovered that we had about an 8-to-10″ gap left! HA! NOT what we were expecting, but we knew we could fix it later. Now all we needed was to get the plastic liner. A few calls to various local hardware stores (and a trip to big-box Lowe’s) revealed that this was not actually an easy part of the process. Not many places have a plastic sheet big enough to fill a rink area of approximately 24′ x 32′. My brother-in-law had gotten a piece big enough for his rink last year at a local store in Buffalo, so I figured I’d give them a call. Bingo! They had it, I purchased it right there on the phone, planning to either make the trip all the way over there, or meet brother-in-law in the middle somewhere. The biggest issue we were facing at this point, early December, was that the weather was NOT cooperating! No sign of freezing temperatures anywhere in the near future! This meant that we didn’t make getting that plastic liner a priority. And that would turn into several snafus later down the line. Being the generous sort (and quick with numbers), my brother-in-law had a proposal. Once he used what he needed for his rink, the remaining liner would be enough (according to our stated dimensions) for our smaller rink! This is quite generous because the plastic we bought ran just slightly over $100, and that was the cheapest option out there! I hesitated slightly—no, more than slightly—because I wondered if the dimensions of his rink were wrong, or the plastic might be cut wrong, or we might have the wrong dimensions… so many things could possibly go wrong here, and we’d be out of luck as the place we got our liner would be out of stock by the time we figured it out. But, after much thought, I decided to go with the generous offer, since it sure seemed that we’d have more than enough. ALWAYS trust your gut. Always. We cut the board, placed it, and hammered in the remaining stakes. Now it was time to lay out the plastic liner! Whoohoo! But, huh… is that really going to fit??? Though that small piece of plastic, well-rolled, did surprise us with its coverage area, we were definitely short. By probably about three feet on either side, length-wise. “I knew it! !” were the only words I could say. I knew this would happen… I should have trusted my gut! Now, before you go blaming my brother-in-law, read on. Since it was clearly short, I wanted to know if he had been shorted on what he purchased, or, well, just what in the world went wrong. We broke out the measuring tape and walked it off. “Huh. Look at that…” 40.5 feet long? Weird. Measured the width. 28.5″ wide. Strange! We had forgotten to measure again, once we resized the frame according to the angled/cut boards (as I mentioned earlier). Sadly, it was unlikely that the 30′ x 100′ plastic we had purchased previously and returned were still available, so we went with Plan B: tape! … to be continued tomorrow! We had heard that some people do just fine by stitching two sheets together with waterproof tape. I did a bit more research online and found waterproofing repair tape was indeed a real product, and might actually work. And it might have, had the weather cooperated. And, had the second piece of plastic been at least close to the quality of the first. Before the water, though, we had to paint! 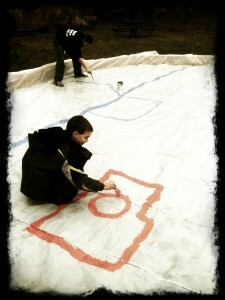 The boys had the fun idea of painting all the hockey lines on their rink. They even had a name (and logo) for their rink! This was probably the most fun part of the entire project! Sadly, the day we were installing the liner and painting, was a very rainy, wet day. So, not much of their art was left the next morning when we began the “Big Fill”. And I do mean B-I-G.
Forty-five minutes into the “Big Fill”, I went to check on the progress, and it looked like a heavy rain had collected on our liner. Just a small puddle in the deepest end. Wow! Guess I’ll give it a lot more time! Four hours later… only about a third of the rink had water in it! Deepest part was at most four inches deep. Holy smokes! Twenty-four hours later of almost constant water flow (we had to stop it a few times because it was reducing water pressure to other things in our house like dish washer, washing machine and toilet!) 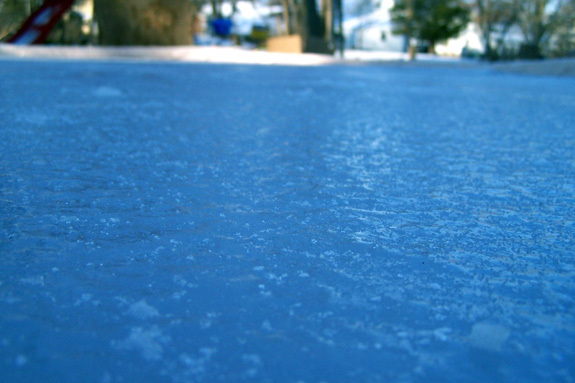 it was about 10″ deep at the deepest spot, and about three quarters of the rink was covered. Nice! But really? Still not done??? I must back up one more time and explain what I think is the biggest reason. The day we were doing the Big Fill, was also a very windy day. VERY windy. Like sustained 30 mph winds. Unfortunately, the slow-rising water, and the high-velocity winds (and the poor-quality plastic) were a major setback for our rink. The wind kept whipping the plastic around, so much so that it tore apart the seem we had created with the waterproof tape. (Guess it’s not windproof.) Now there are very obvious holes in a couple spots in the seem, and being slightly submerged, we can no longer apply the tape (it needs a dry surface). Our last attempt to make this work is to let the very cold air tonight and tomorrow freeze what’s in there (including some over part of the seem) and perhaps let the ice be enough of a seal as we add more water, little by little? The problem with this plan is that the ice will very likely melt in the next week or so (at least a little) … so, will our crazy ice-seam be enough to hold? Allow about THREE DAYS to fill the rink!!! Preferably NOT windy days! I’m thinking the lessons are not done just yet … but that’s what we’ve learned so far. I’m pretty sure we’ll get to skate on this rink, even if it hasn’t worked out entirely as planned. And without a doubt, it has been a super fun family project the whole time. Unexpected turns of events and all! Who knew that this project would have so many hurdles and barriers and pitfalls? I knew it would be work, but aside from our being novices in building an ice rink in our back yard, we have also faced plenty of challenges from the weather! 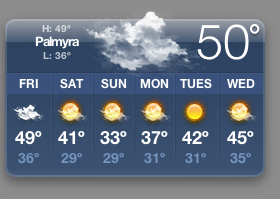 Check out the forecast: 50º right now, and not a freezing temp in sight! When are we gonna catch a break?! The good news is, the kids are still having a blast with it, and what I wrote in Part 2 of this saga will still greatly improve next year’s rink, if we do get to do that. For now, we are happy with our little less-than-perfect ice rink. We finally got usable ice after about a day and a half of super-freezing temps (10s). And then it was only “usable” by the lightest in our family. The heavier boys (who coincidentally also love using the rink the most) were a bit too much for the weaker ice, and it cracked in a few places under their weight. Still, they would not be deterred and have even set up a makeshift hockey goal for when the cold weather finally does arrive. For now, we once again gaze out our window at a green lawn, and a surprisingly quickly melting “ice” rink, yearning for much more seasonal temperatures. We are glad for those who like warmer weather, but not-so-secretly, anxiously awaiting the arrival of real Western NY winter weather! Bring it on Old Man Winter! In that most of them live in the same region that we do, and have experienced this unusually warm winter along with us, I usually give them a wry smile and then gauge whether they are truly up for the full story, or not. 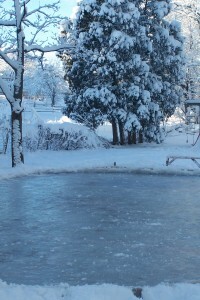 But here, I will close out the Winter of 2012 Campbell Family Backyard Ice Rink story. So clearly, that has been a problem. But as was mentioned previously, the grade of our land being greater than we anticipated, along with the plastic not being large enough for the rink we made… and then, our attempts to bond two pieces of very un-equal plastic sheets together being thwarted by two ridiculous windstorms ripping apart the seam we had so tenuously bonded. Ugh. It’s been one thing after another. Simply astonishing. Stymied at every turn, which does tend to get you down a bit… and nearly give up trying. BUT. And that was a big BUT. Our kids still love it. 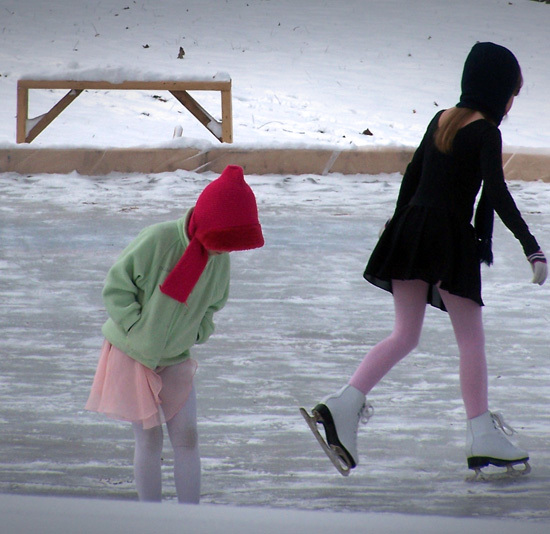 They have been out on the half-rink of ice as many times as they could. Whether using skates or just boots, they play a few periods of hockey, work on their tight turns, or just have the winter fun we were hoping to have in our back yard! We are really ready for next year! Really! We’ve learned so much, we know exactly what to do to make the best ice rink (that we can afford!) in Wayne county! We’re excited to try it out. I think we might have the rink ready to go by Thanksgiving weekend next winter! We have everything we need for our raised gardens in the spring! We attempted to plant a garden with many great veggies in our back yard a few years back. Much to our chagrin, most of the plants did not do well at all. (I think we harvested seven tomatoes!) By a stroke of curious luck, I happened to see an article in a newspaper from my hometown of Springfield, OH that described all of the trouble we had been having, and attributed it directly to walnut trees. Bingo! We have (too) many walnut trees on our property and several adjacent ones! So, in a subsequent summer we did cultivate a few self-contained tomato plants on our deck, which was fine, but we wanted to do more. Our best idea was to build raised gardens, but we needed to buy wood, and plastic to hold the dirt and compost and such (and keep it away from the walnut tree roots). WELL, enter our “ice” rink! We were wondering where we’d store it all summer… and now we know! So it’s not been the joy we thought it would be, but we really have no complaints. We’re glad we did it, and it’s fun to see the silver linings listed above. There are several. Well, actually, this year it has not been the worst of times. Sure, we’ve had our travails, but nothing like last year. This year’s version of the backyard ice rink has been much more successful thanks to wisdom gained from past experience (read: failures) and thanks in larger part to the weather actually cooperating this winter! In that we’ve had a much more normal winter, temperature-wise, we’ve been able to actually use our rink, and I think learn a bit more for next year, too. For example, we’ve been able to experiment with resurfacing the ice, keeping it cleaned off, and even learned that snow blowers are NOT an ice rink’s friend. If you’ll recall, last year we (meaning, I) forgot to re-measure the rink dimensions after we extended it… leaving us very short with the pre-measured plastic! Oh boy! Then there was the 14-inch plus difference from one end of the rink to the other, leaving us with no water in one end of the rink. Wow. We had plenty of issues last year. There were some things we learned and improved this year, though. We were able to fill the flatter, smaller rink in less than a day (much shorter than last time) and we got it filled just before a string of sub-freezing days. And so, as you can see, we’ve been able to use our back yard ice rink this year! Fantastic! One thing we’ve learned is that, thought the flatter ground was great, it also happens to be under several trees. This is not a good idea. Throughout the winter so far, leaves and branches have regularly fallen down into the rink. The leaves are certainly unattractive; they are also trouble when they freeze into the ice near the surface. That leaves rough spots at least, and even cracked spots or bumps. Not good. You don’t want to throw it on your rink!!! We had bumpy ice there for a month! Couldn’t get the ice smoothed out on the side where the snowblower had blown its snow. Definitely be careful with your snow blowing! We have been able to use the hose to add layers of water, smoothing out the used and/or bumpy ice surface. That part is good… the bad part is when the hose gets left outside in sub-zero temperatures! Oops! We recovered the hose at the next thaw, but it was lost for a few weeks there. That’s a funny phrase, “Live and learn” … it’s not actually true unless your “living” includes doing. So, we’ve been “doing” for a couple years now, and we have a fun winter of ice-capades to show for it, and several noggins full of backyard-ice-rink knowledge to put to good use next winter. We should have a fantastic rink in year three! Look out! A quick check of the 10-day forecast shows plenty of lows in the 20s, so there should be some more ice rink fun in our near future. Nice! If you like ice sports … we Campbells highly recommend you try this project in your own back yard!